There are significant uncertainties in plans for cleaning-up Sellafield. The Authority is working to understand and address project under-performance. "Owing to historic neglect, the Authority faces a considerable challenge in taking forward decommissioning at Sellafield. It is good that the Authority now has a more robust lifetime plan in place but it cannot say with certainty how long it will take to deal with hazardous radioactive waste at Sellafield or how much it will cost. "Securing future value for money will depend on the Authority’s ability to act as an intelligent client, to benchmark proposed levels of performance and to provide better contractual incentives for making faster progress towards risk and hazard reduction." A report today by the National Audit Office highlights the considerable challenge faced by the Nuclear Decommissioning Authority in taking forward the clean-up of Sellafield, the UK’s largest and most hazardous nuclear site. To date the performance of some of the major projects at Sellafield has been poor. 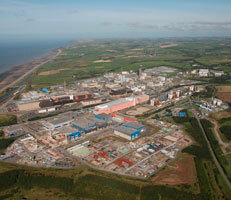 However, the Authority is taking appropriate steps with Sellafield Limited to improve this. It is too early to judge whether the Authority’s appointment of Nuclear Management Partners Limited as the ‘parent body’ of Sellafield Limited is delivering value for money. The Authority inherited a legacy of poor planning and neglect over several decades when it took ownership of Sellafield in April 2005. The Authority achieved an important milestone in May 2011 when it approved a more robust lifetime plan for the clean-up of Sellafield site by 2120, replacing a previous unrealistic plan. The improved lifetime plan contributed to an increase in the Authority’s provision for decommissioning the site to £67 billion (undiscounted) as at March 2012, up from £47 billion as at March 2009. Significant uncertainties and scheduling risks remain, which the authority is working to understand and address. For example, there is considerable uncertainty over the time required and cost of completing facilities to treat and store highly radioactive material held in deteriorating legacy ponds and silos. Today’s report concluded that it is too early to judge whether the appointment of Nuclear Management Partners Limited as the parent body of Sellafield is delivering value for money. The parent body has achieved improvements in commercial operations on the site, including the reprocessing of spent nuclear fuel, and expects to deliver at least 80 per cent of its planned savings of £1.4 billion. However, the NAO found that some of the NDA’s 14 major projects at Sellafield have not provided good value for money. These projects are for the design and build of complex chemical engineering projects to retrieve, package and store hazardous nuclear material from old facilities. The projects range in cost from £21 million to £1.3 billion. Twelve of these projects delivered less than planned during 2011-2012, which could delay risk and hazard reduction. The Authority is taking appropriate action to improve Sellafield Limited’s performance on major projects and its own capacity to oversee delivery. It is also considering how to strengthen the fee incentive framework if it chooses to renew the agreement with the parent body in 2014.